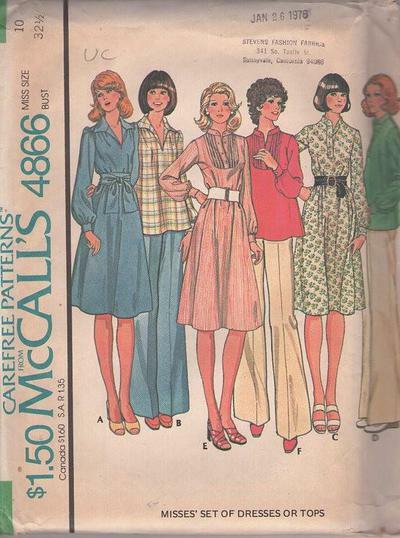 1975, 70s Office, Retro Secretary Clothing Patterns - Ladies' blouses or dresses in three basic styles: A and B have slit neck, bodice front gathered into shoulder yoke, and pointed collar. C and D have placket neck closure, band collar, and bust darts. E and F have bust darts, band collar, and tuxedo front. Tie belt or sash. Long sleeves with buttoned cuffs.